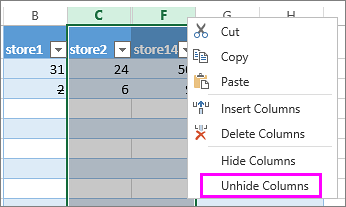 Hide or unhide columns in your spreadsheet to show just the data that you need to see or print. Select one or more columns, and then press Ctrl to select additional columns that aren't adjacent. Right-click the selected columns, and then select Hide. Note: The double line between two columns is an indicator that you've hidden a column. Select the adjacent columns for the hidden columns. Right-click the selected columns, and then select Unhide. Or double-click the double line between the two columns where hidden columns exist. Do you see double lines at column or row headers instead of the columns or rows, like in this picture? 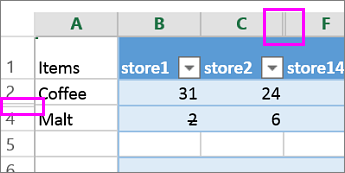 Select the columns before and after the hidden columns (like columns C and F in our example). Right-click the selected column headers and pick Unhide Columns. Select the rows before and after the hidden rows (rows 2 and 4 in our example). Right-click the selected row headers and pick Unhide Rows. 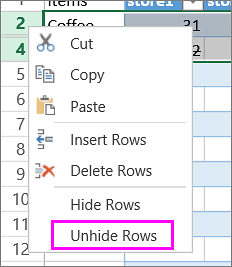 Note: When consecutive columns or rows are hidden, you can’t unhide specific columns or rows. First unhide all the columns or rows, and then hide the ones you don’t want displayed.